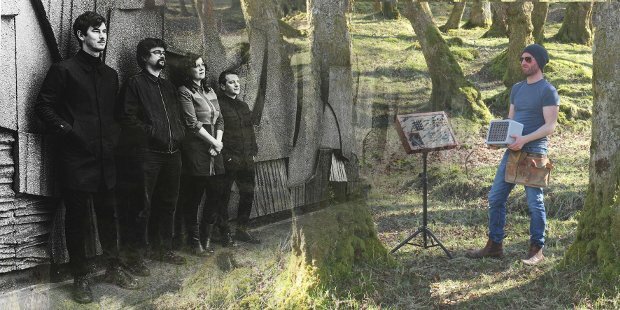 Now that the fun/trauma of the Edinburgh Festival and doing all of those summer music festivals is out of the way, we find ourselves with a backlog of good music to catch up on from a summer which seems to have inspired a heavy dose of looking back to the good old days from artists across Scotland. Whether it's the music they're playing or the misty-eyed lyrical themes, everybody seems to be romanticising the past. Let's start with a strong and unique contender in Fun Day, Cool Times by MC Almond Milk (★★★★☆, Save As Collective), aka the latest release from rapper and producer James E. Scott, also of CARBS and Conquering Animal Sound. 'Hi Jamie / 1995 called / it wants its summers back,' he swoons on the opening '1995', remembering 'the torn jeans / the dirty gutties / the bowl cut,' before taking us on a five-yearly travelogue of growth, nostalgia and disappointment within the song. The sound is nostalgic too, a kind of Caledonian trip-hop of circa 1995 vintage, and the incessant retro styling of the music cuts through as much as his wistful and literate lyricism on 'Wet Wednesday Pt 2''s blend of DJ Shadow beats and Justin Timberlake hook-writing; the hypnotic chip-pop of 'Lost in Drakies' (featuring Gav Prentice of ULTRAS); and the striking, Vangelis-like sci-fi poem of 'Was Swept Away, I Think That Always Happens'. It's a powerful record, a convergence of youthful influences used in service of speaking frankly about ageing and cultural connection slipping away with the years. The launch party is at the Happiness Hotel, Edinburgh, Sat 30 Sep.
Also trading on a sense of wistfulness, albeit one borne of a very different style, is Adam Holmes & the Embers, whose Midnight Milk (★★★★☆, Gogar Records) is a straight-up, middle-of-the-road rock record which flies on Holmes' gravelly, soulful delivery and his loving appropriation of various styles of music, whether that's on the bright, summertime reggae groove of 'Don't Worry', the warm afro style of 'Strange Weather', or the horn-laden gospel of 'Whatever It Is You Do'. It's a measured and accessible listen whose influences add richness in the vein of Paul Simon or Paulo Nutini, and it can be heard live when Holmes tours Scotland and the UK with Rachel Sermanni throughout October. The former frontman of Edinburgh's Collar Up Stephen McLaren, meanwhile, is lost 'ten years ago in a tent in Balado' on the title track of his solo album We Used to Go Raving (★★★☆☆), and for all that his lyric for this misty-eyed piano-and-guitar ballad dwells on the olden days, basing it on an insistent house piano line is a nice touch. Throughout, the piano and orchestration is devotional, McLaren's reverb-heavy voice sounds beamed from the future and his songs ('Chest Pains Lullaby', the glistening 'Yet Again, I Have Offended Everyone', the Sigur Ros-echoing 'When I Need Someone to Hate, I Close My Eyes and Think of You') bear a devil-may-care moroseness to their lyrics of which Morrissey might be proud. Trading on a sound which was startlingly retro even when Franz Ferdinand were doing it over a decade ago, Glasgow's Ace City Racers are still at their best a pretty great band. Standout tracks on Take It, It's Yours (★★★★☆) are '21C Sights', the yelping, Stooges-channelling 'Diamond 700' and the frayed Factory Records-meets-The Fall 'I Haven't Been a Good Boy'. They may want to recreate sounds we've heard before, but at least it's with maximum authenticity and energy. As a longstanding labelmate of The Penpushers on KFM Records, Edinburgh producer and sometime Soul Biscuits promoter Nasty P is something approaching an elder statesman of the Scottish rap sound. Unlike many of his newer contemporaries, his use of guest vocalists on the new album Rich Mundi (★★★☆☆, KFM Records) means his style is distinctly transatlantic, rather than obviously homegrown, and there's a retro feel to the scratching and spinback-heavy sound of the guest-strewn 'No Tellin', for example, or the screeching rave vocals of 'The Win'. Yet his composition is strong, particularly on the stridently soulful, Jane Gilbert-starring 'One More Time' and the instrumental mood pieces which make up the latter half of the record. Expect more exemplary fan service from Gun's eighth album – and fourth since their comeback a decade ago – Favourite Pleasures (★★★☆☆, Caroline International), a record which is trying to rattle down no unopened doors, but which lives up to past work with an energetic selection of shinily-produced rock and glam-influenced party tracks. Another blast from the past, but this time one with urgently contemporary appeal for fans who continue to take his band to heart, is the perennially underrated Deacon Blue's Ricky Ross, whose Short Stories Vol 1 (★★★☆☆, earMUSIC) follows up his group's most recent album with an affecting solo set of new and old material for piano, voice and choir, including 'Raintown' and 'Wages Day'. Hailing from the same city as Ross, Dundee's former John Peel favourites Spare Snare have carved out a very creditable niche for themselves as proper survivors of the Scottish scene. Here they return with their applause-worthy 12th album Unicorn (Chute Records, ★★★☆☆), a resolutely lo-fi selection of DIY indie soundtracks made for playing at high volume in sticky-floored, outsider-filled basement rooms, a proper alternative group happily surviving outside of the mainstream. Released earlier in the summer, we'd also like to pick out a few new records which deserve their due. Among them, Alex Cornish's album Hang on the Word (★★★☆☆, Bellevue Records) is a delicate, atmospheric piece of piano and guitar-led singer songwriting from a capable and emotive artist whose clean-cut style reminds of a dreamier, less bombastic Coldplay, while Stephen Solo's (aka Stephen Farrell) PII2 (★★★☆☆, Last Night From Glasgow) wraps up some highly distinctive songwriting which takes apparent influence from Prince, The Beatles and Heaven 17 in a very lo-fi, phone-recorded aesthetic which doesn't quite contain the expansiveness of his ideas. Finally on the album front, we're going to break with the theme of the month and talk about something relentlessly forward-thinking; the new record from Glasgow's mighty Night School label. Oakland Cold Wave producer Dania Luck is Stacian and also Person L (★★★★☆, Night School), and her latter alias is also the title of this album; for anyone with modestly eclectic tastes this record is strongly suggested, a dark and atmospheric mix of ambient industrial techno and rough-hewn, DIY vocal electro from an always-essential imprint. We're not done yet, though, with a brief word on a bunch of recent singles and EPs you may want to experiment with. In split-single news, Mt Doubt's cascading guitar anthem 'Mouthwash' and Acrylic's pensive post-rocker 'Where I Lie' are evenly matched on the new split from Scottish Fiction (★★★☆☆), while Lomond Campbell's pleasingly rustic 'Father is a Craftsman' and Modern Studies' folksy, psychedelic 'Every Florist in Every Town' (★★★★☆, Triassic Tusk) sees two of Scotland's most distinctive bands cover one another in honour of last month's Sounding residency in Edinburgh. Freshly repressed on 12-inch vinyl, the Glaswegian Komodo Kolektif's Sumantras EP (★★★★☆, Invisible Inc) is a dark joy, a claustrophobically atmospheric selection of music for synthesisers and Indonesian Gamelan instruments which wears its Psychick Warriors ov Gaia influences proudly, and Triassic Tusk's excellent remix package for The Sexual Objects' blissed-out beat-pop track 'Sometimes' (★★★★☆) features a dubby take from Andrew Weatherall and a gorgeously radical reinterpretation from Boards of Canada. Summer's over now, of course, and the last few rays of late evening might be found in the infectiously soulful 'Enough For Me' (★★★☆☆, Belladrum Records) by Cromarty's Tamzene - a track which points to proper breakthrough potential if she has more like it – and the delicate, Nick Drake-style folk-pop strolling of Crow's Feet's 'We're All Here' (★★★☆☆). Finally (we mean it this time) it's back to Dundee for 'Over Bridges' (★★★☆☆), the promo single for the city's 2023 European Capital of Culture bid by ex-Danny Wilson singer turned LA pop songwriter Gary Clark, who has drafted in Model Aeroplanes and The View's Kyle Falconer for a song which is refreshingly contemporary and forward thinking. And for the new students, it's a busy old Freshers Weeks for Underground Live, as their new school year kicks off with a week of gigs to give new students a taste of what the local scene has to offer. Highlights from this week include DopeSickFly, who're punting their acid rock-y funk (which won a Celtic Connections Danny Kyle Award this year, you know) all about the place on Thu 14, as well as The Van T's, who'll be coming down from a summer of festivals with nostalgic surf pop sounds to get you dancing on Fri 15.